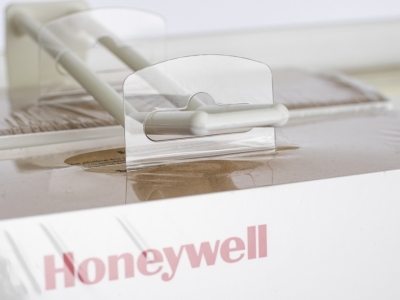 Honeywell needed a hang tab that could provide several key features for its thermostat product line. First, the hang tab needed to hang the product box securely. Also, the large box should hang centered, in an attractive manner, on a peg hook. And finally, the hang tab should remain unchanged during the shrink-wrapping process. Do-It’s Answer: The R-JAB Interior Hang Tab. The R-JAB securely adheres to the interior of the top of the thermostat box. The 20 mil plastic hang tab extends through a slit at the top of the box and remains unchanged during the heat sealing process.